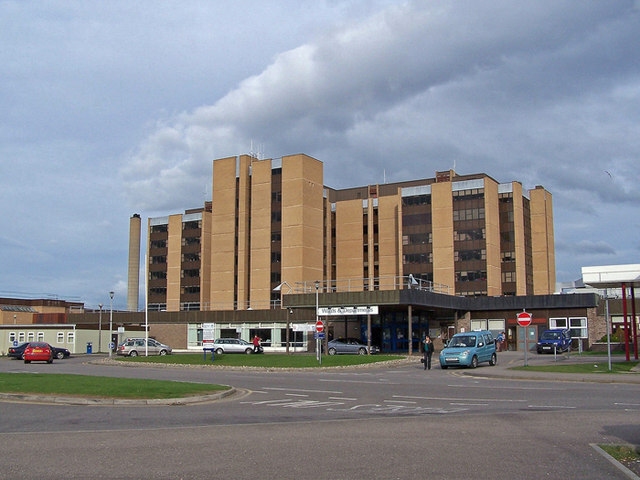 Inverness’s general hospital at Raigmore is the largest and only acute hospital in the NHS Highland’s estate, serving patients from a huge area. It was designed in the post-war era as one of the new National Health Service’s centralised district general hospitals, in this instance to replace the Royal Northern Infirmary and numerous smaller hospitals, providing a full range of medical and surgical facilities, as well as specialist departments. It was constructed in two main phases in the 1960s—’70s, and ’70s—’80s, but its history begins during the Second World War. Raigmore Hospital began as an Emergency Medical Scheme (EMS) hospital, one of seven large new hospitals built in Scotland for the anticipated casualties during the War. Work on the site started in 1940. The builders were James Campbell & Sons, builders, with MacDonald, joiners, and the first wards were completed in 1941. The hospital followed the standardised EMS design, but restrictions on the use of timber and steel for building construction meant that here the single‑storey, flat-roofed ward blocks were constructed of brick..
On the 40‑acre site, on the southern outskirts of Inverness, sixteen standard wards and one isolation block were built to provide around 670 beds. Staff quarters were located in the blocks on the north-west side of the complex, with a tennis court just to their south. At the heart of the site, between the staff quarters and the main ward huts was the admin section with the central kitchens, dining rooms, laboratories, matron’s quarters and services. An isolation block, Ward 17, was to the east of the central section. This was converted into a maternity unit in 1947, and then became a children’s ward in 1955. The buildings on the north-east side of the site were part of the Raigmore home farm. Block plan of Raigmore based on the OS 1:1,250 map revised in 1961. As with the other six war-time hospitals, Raigmore became part of the National Health Service on the appointed day in July 1948. Some new specialist departments were created, wards changed function, and additions were built – including an outpatients department in 1956. Raigmore had already become a General Training School for nursing in 1946. Plans for a new central general hospital at Inverness formed part of the 1962 Hospital Plan drawn up by the Department of Health for Scotland. Raigmore was the obvious choice of site. The new hospital was designed to be built in two major phases of construction, and J. Gleave & Partners were appointed as architects. Phase one was commenced in May 1966, and was largely completed and opened in 1970 having cost some £1.42 million. The largest part of the new hospital was situated to the south of the main wards, comprising a low-rise complex providing outpatient, radiotherapy, physiotherapy, occupational therapy, pharmacy and records departments. A standard plan for out-patients departments issued by the Scottish Home and Health department was adopted here. The architect to the Northern Regional Hospitals Board (NRHB), D. P. Hall, was part of the project team, as he was on the two other contemporary major schemes carried out by outside architects for the Board, Belford Hospital (also designed by Gleave & partners) and Craig Phadrig. All senior officers of the NRHB were also part of the team, ensuring that there was advice from administrators and medical staff. Other additions to the site at this time included a new Inverness Central School of Nursing and Post Graduate Medical Centre, built to the north of the original ward block, and nurses’ accommodation, located to the west of the old central admin area. The second phase was approved in 1977, comprising the eight-storey ward block with operating theatres, kitchen and dining rooms, an administration block, a chapel and a works department. Work commenced in 1978, and the tower block was opened in March 1985. Further staff accommodation formed a separate contract, with three blocks of 32 bed-sitting rooms, 32 three-apartment houses and a block of two-apartment flats. Gradually all the war-time buildings were demolished. Part of the cleared ground was allocated to a new maternity unit which opened in January 1988. The last huts went in 1990, the same year that a new isolation unit was completed. The fourth Maggie’s Centre in Scotland opened beside Raigmore in 2005. Situated in a green space to the south of the main hospital complex, the leaf-shaped building was designed by David Page of the Scottish architectural firm Page and Park Architets, with gardens designed by Charles Jencks. In stark contrast to the EMS hospital, the central feature of Raigmore Hospital today is the multi‑storey ward‑tower, which strikes the view of all who arrive in Inverness by car from the south on the A9. This entry was posted in General Hospitals, Scottish Hospitals and tagged Emergency Medical Scheme, Inverness, J. Gleave & Partners, Maggie's Centre, post-war hospital buildings, Scottish Architecture, Second World War. Bookmark the permalink.